Ford has put the traditional instrument cluster of a car under the knife. After much experimentation and creative thought, the operation is complete. The American car manufacturer is touting a 10-inch digital display that shows all the vital information of the car in clearly legible text that the company says is meant to reduce driver distraction. The main point of the display is its versatility - the 5 driving modes: normal, wet, sport, track and V-Max each alter the display of the instrument cluster according to the situation. You can cycle through the different modes using a knob mounted on the wheel, here you can also make further adjustments like changing the ride height or putting rear spoiler up or down. Each mode means different information is placed at the front and centre of the driver, in normal mode for instance, the speedometer has the greatest presence with gear selection to the right and fuel and temperature taking the top left of the 10-inch display. However, sport mode is completely different in both theme and focus, you’d expect that if you’re going to be taking full advantage of 3.5-litre V6 engine inside this monstrous supercar. In this mode the gear selection takes top priority with the speedometer taking a less prominent position on the right hand side. All of this is displayed in an aggressive orange theme that dares you to red-line every gear change. V-Max takes the title of the most exhilarating mode however. This mode is all about pushing the over 600 brake horsepower car to its limits. This mode is all about pursing maximum top speed, so naturally the speedo is displayed large and centre while further details such as coolant temperature, oil pressure, oil temperature and turbocharger boost decorate the big number in focus. 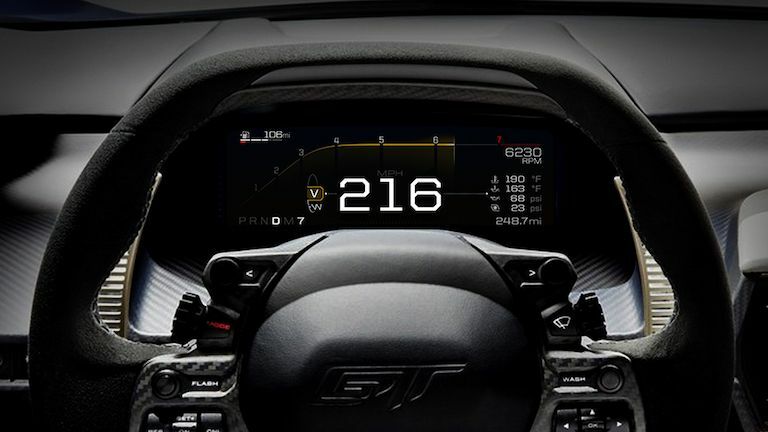 Although the 10-inch display in the cockpit is making its debut with the GT when it released later in 2017. Ford is emphasising this is just the beginning in a switch to digital instrument clusters in all their manufactured cars.